With lush, tropical, authentic paradise, Qamea Resort & Spa is situated pride of place in the Northern Fiji waters, awaiting your arrival. Committed to, and preserving the natural environment, culture and traditions of Fiji, Qamea Resort & Spa is the ultimate retreat. This luxury Fiji island resort is set on a private 100 acres with picturesque volcanic mountains soaring behind the property. The island is a lush tropical, garden paradise with cascading waterfalls and a white sandy beach. If you’re looking to celebrate a special occasion with your friends, family or work colleagues why not book the entire resort. Explore the island on foot or by sea. From mountain hikes to jungle waterfalls, snorkelling off the beach or diving with the professionals (PADI 5 star accredited dive shop), sea-kayaking or sweating it out at the gym and stretching it out with Yoga. Surfing is available from November through to April, with guided assistance and lessons if required. Relax and unwind with a spa treatment at Fiji’s only Guinot Spa which has been voted 2018 best luxury destination spa. Take a romantic picnic lunch in a secluded part of the island with your special someone or simply laze on your verandah enjoying a cocktail watching the magnificent sunset that Fiji is famous for. Just about everything is here at Qamea Resort & Spa. Continental breakfast, Wi-Fi, in room dining, use of non-motorised activities (kayak, paddle boards, snorkel gear), nightly entertainment are included in your stay. Meal packages are available and recommended. Once you’ve landed at Nadi international airport, take a scenic 50min flight to Taveuni Matei Airport. You will be greeted by a friendly member of staff and driven 30min through villages and the tropical surrounds of Taveuni, an enjoyable sight in itself. You’ll be met by boat and instantly feel the warmth of the waters on the 10min journey to your destination of Qamea Resort & Spa. We love the amazing staff at Qamea, the delicious food and the magnificent surrounds offering many activities. 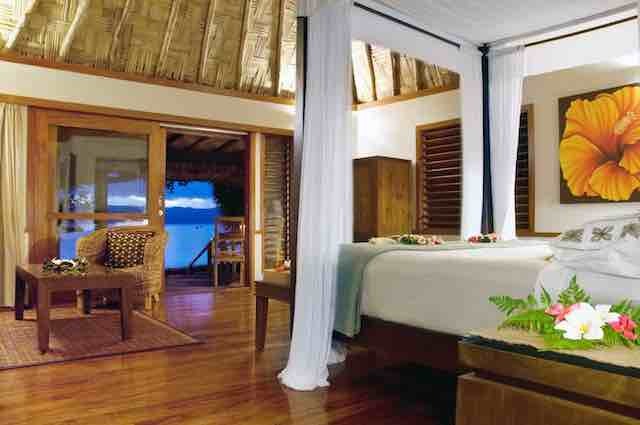 This is a great resort for the adventurer, loved up couples or groups. This boutique resort caters for a maximum of 36 adults in 17 traditional styled, Fiji luxury villas set amongst tropical gardens and palm trees. Each villa is expansive inside and out, including large covered verandah’s with hammock, outdoor showers, plush king beds, air-conditioning and fans, and many with private pools or jacuzzi spas. 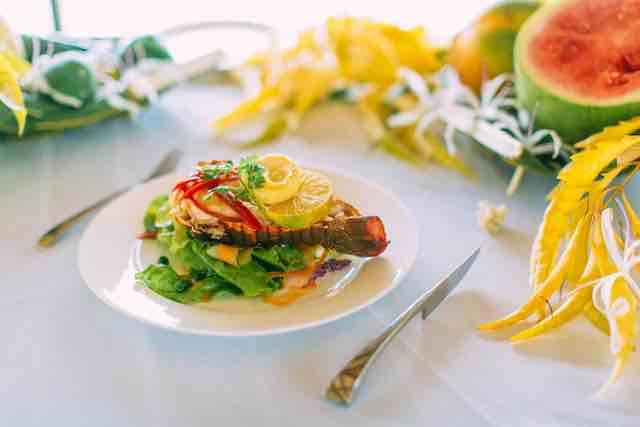 Qamea Resort prepares daily seasonal menu’s using fresh, organic, local sourced produce. The team of Chef’s use local caught seafood from the surrounding waters of Qamea and serve up culinary delights to rival top restaurants. The resort caters to vegans, vegetarians and food allergies, so rest assured your needs will be met. Your meals will be served in a relaxed, ambient atmosphere by the friendliest of staff. Private dining can be arranged in the private gazebo, on the beach or in your villa. This resort is one for the foodies with all inclusive meal packages available.